This Things To Be Thankful For activity sheet is the perfect printable to hand out to your children around Thanksgiving. It gives them a chance to think of what they are most grateful for from A to Z. This Thanksgiving season is the perfect time to spark a conversation with your children about all the things they should be thankful for in their lives. Believe me, this sheet isn’t big enough to fill them all. I KNOW! But it’s a start! 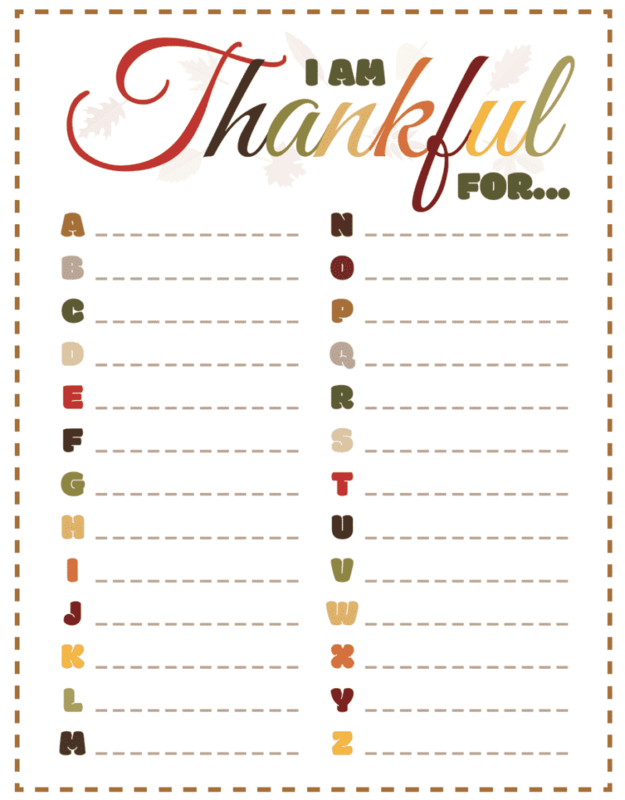 Now that all three of my children are in full-time school, I thought these Thanksgiving printables would be a perfect way to teach a little gratitude. Children don’t always realize what they have. Heck, most adults don’t either! It doesn’t have to be grand either – it could all start with a small thought like a focus on HEALTH or FOOD. We all take those things for granted, don’t we? I read a book a few years back and it actually changed my life and really showed me what my things to be thankful for were all about. I’m not being dramatic. It literally changed my life. I finished it on a plane while coming home from LA. After it was over, I put it down and didn’t do anything else. I just sort of watched as we landed in NYC – almost for the first time ever. Every other time I flew, I typically drowned myself in a movie or went to sleep. Anything to avoid the actual PRESENT REALITY of what was happening. Who cared, right? Well – on that day – I just watched and noticed something spectacular. The city was twinkling. Literally twinkling. The trees felt like Christmas. The entire world was lighting on and off and it looked absolutely beautiful. I couldn’t understand? I was Platinum – typically am – because I fly SO MUCH for work and had never seen that before. Why were the trees twinkling? Was I so tired that my mind was playing tricks on me? NYC couldn’t possibly be dressed up for Christmas on such a grand scale? How could this be? I studied it – all of it – trying to figure the whole thing out. But from my altitude, I just couldn’t. It just looked beautiful. So, I gave into it and I watched it and I smiled. I didn’t take pictures. I just watched the twinkling trees that I knew weren’t real but that were absolutely surreal. I knew that I would make sense of it eventually – so I enjoyed it while I could. And then after a few minutes, once we got closer to the ground, I realized that the lamp posts were the cause of the twinkles. I was seeing the lights of the lamps hide and then unhide behind the trees as we passed quickly above. It was an illusion. The magic trick was revealed. And I started to cry – like noticeably SOB – on the plane. Not because the magic was revealed but because I was present enough to witness it for the first time in my life. All because of that book. All because of that author. I’ve read several of his books at once and they truly gave me a different perspective on life.Now, whenever I fly, I look forward to the twinkling trees and for my moments of stillness that come as I observe their wonder. There are so many things to be thankful for in life. Small or large. I am so busy all the time. I hate it. I hate my current state of chaos. But when I fly – I look for that moment to remind myself that there is beauty in everything. You just have to stop yourself for long enough to find it. 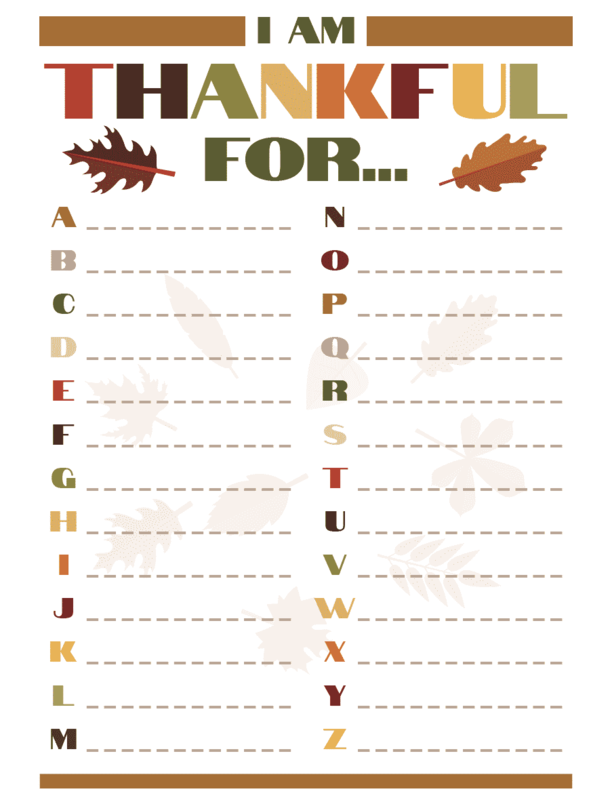 Click here to download your free Thanksgiving Activity Sheet. There are two different versions for you to choose from – script and bold. I’m showing both options here for you to consider. What a great way to sum up all the things to be thankful for on one piece of paper. When the kids come home, print out a few copies and work on them together as a family. Then compare your answers! This is so adorable!!! Sharing with the world! !